Of course these semi-seawater to freshwater "Pipes" are part of the same family as the Seahorses, Pipefishes found in tropical and subtropical oceans (Syngnathidae), and subfamily Syngnathinae. Often lost due to a lack of understanding, practice in providing them with small, appropriate live foods on a frequent basis, as much as too little cover for them to hide, feel comfortable in and too-rambunctious a mix of tankmates, some public aquariums and commercial concerns have "closed the loop" with these species, raising their young and in turn spawning, rearing progeny in turn from this generation. Doryichthys boaja (Bleeker 1851), the Long-Snouted (Freshwater) Pipefish. Asia: Indonesia, Malaysia, Thailand, Cambodia and Viet Nam. To about sixteen inches in length. 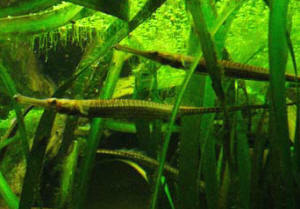 Largest freshwater pipefish species. Feeds on insects, crustaceans and worms. Aquarium pic. Doryichthys retzi, the Shortnosed Pipefish. Southeast Asia. Enneacampus ansorgeii, the Congo Pipefish. West Central Africa. Oostethus brachyurus, the Opossum Pipefish. Southeast U.S.
Oostethus lineatus, the Lined Pipefish. Mexico to Brazil. Syngnathus scovelli, the Gulf Pipefish. Gulf of Mexico. Not too vigorous or linear water movement, darkened/not over-illuminated, with similar "grass like" (Zostera, Phyllospadix spp. for example) live or faux plant cover. At least three times daily (continuous is ideal as with a sump, automated feeding device) with live foods of small-enough size (some authors have utilized freshly hatched out Brine Shrimp supplemented or not) to fit the adult fishes mouths. Juveniles need much smaller food items.